Professor Jayashankar Telangana State Agricultural University invites online applications from Diploma holders in Agriculture and Seed Technology for admission into the first year B.Sc. (Hons.) Agriculture Degree programme through a Computer Based Test AGRICET-2018 and Diploma holders in Agricultural Engineering for admission into the first year B.Tech. (Agricultural Engineering) degree programme through a Computer Based Test AGRIENGGCET-2018 for the academic year 2018-19. 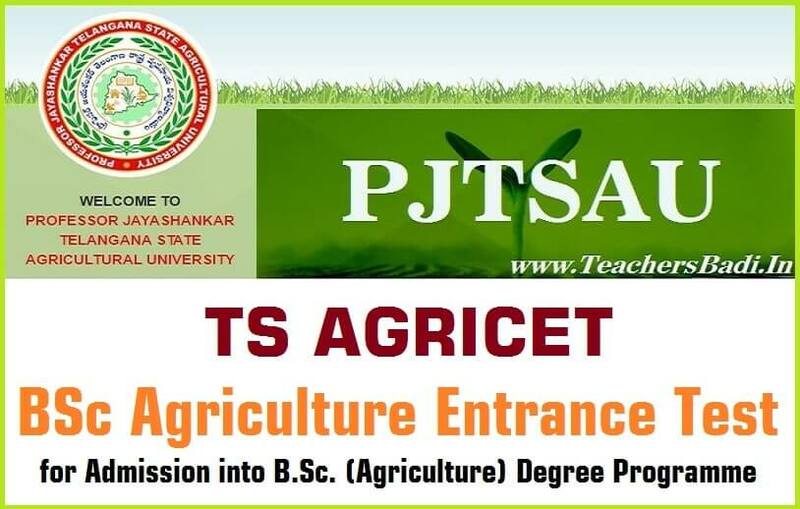 The candidates should have pass in Diploma in Agriculture/Seed Technology from PJTSAU / ANGRAU (Candidates who are appearing for Second Year Diploma in Agriculture/Seed Technology Examinations during June, 2018 can also apply this cet). The candidates shall be required to have completed 17 years of age as on 31st December of this year of admission with an upper age limit of 22 years for all the candidates. However, in case of SC, ST candidates the upper age limit shall be 26 years and incase of Physically Challenged candidates it shall be 28 years. Reservation: As per rules of PJTSAU. Forty seven (47) seats in B.Sc. (Agriculture) (42 seats for Agriculture Diploma Candidates and 5 seats for Seed Technology Diploma Candidates. Admissions will be made strictly as per the rule of reservations of PJTSAU based on merit through the Entrance examination in Telugu language (objective type) to be conducted at College of Agriculture, Rajendranagar, Hyderabad - 500 030 and Telangana polytechnic students as per schedule. So, the admissions to the above said course shall be based on the merit list prepared as per the marks obtained in AGRICET-2018 and as per the rule of reservation. The Entrance Test consists of 100 Multiple Choice Objective Type Questions and the candidates shall have to answer in OMR Sheet. Admissions will be made strictly as per the rule of reservation based on merit through the Entrance Test's. The AGRICET & AGRIENGGCET entrance test will consist of 100 multiple choice objective type questions and the candidates shall have to answer in OMR sheet. The AGRICET Entrance test will be conducted on 23-07-2018 from 10.00 AM to 12.00 Noon. and AGRIENGGCET Entrance test will be conducted on 22-07-2018 at College of Agriculture, Rajendranagar, Hyderabad - 500030 from 10.00 AM to 12.00 Noon. 2. Attested copy of the SSC marks memorandum and Diploma Marks Memorandum. 4. Latest Caste Certificate (In case of SC/ST/BC’s). 6. Three Passport size photographs pasted on the application form. 7. Demand Draft for Rs.300/- (Rs.150/- in case of SC/ST/PH) drawn in favour of Comptroller, PJTSAU payable at Hyderabad. 8. The filled in form should be sent on or before ~~~~~~ by 5.00 pm to the Convenor, AGRICET 2018, Department of Entomology, College of Agriculture, Rajendranagar, Hyderabad 500 030. 9. With late fee of Rs.600/- (Rs.300/- in case of SC/ST/PH) up to ~~~~~~~. 100 multiple choice objective type questions. A sample/mock test will be available for practice purpose and to give the candidate a look and feel of the Computer Based Test (CBT) at the University website: www.pjtsau.ac.inone week prior to the Entrance Test. 2. Applications can also be submitted up to ~~~~~~~~~~ with late fee Rs.600/- for General and Rs.300/ for SC/ST/PH candidates. Students are advised to check the Official website regularly for the latest guidelines and updated information on notification, courses and application Process. and name of colleges of BSC Agriculture plese send me mail feel free to my mail here.